Ok, so I’m the last person on the planet to discover the rebooted Dr. Who. Regardless of that, I’m having a blast enjoying the 2005-2011 episodes thanks to Netflix. I’ve enjoyed the (mostly) excellent writing. I’ve loved the wittiness. I really like the music. But there’s something else I really appreciate. In a media world that tends to favor violent characters like Jack Bauer in 24, it’s a wonderful thing to see a character who triumphs by the power of words and wit, cleverness and compassion. I love that the Doctor gives his enemies a choice before he stops the problem, and that he solves his issues without guns. Yet he is the most feared thing in the universe. 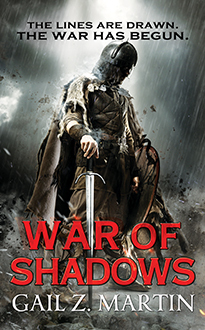 He understands that winning can come at a terrible price, and that power corrupts. And although he has people who love him, he is still very alone. That vulnerability makes him as human as the mortals he protects. Favorite Doctors? I’m very partial to Matt Smith (you never forget your first Doctor), with David Tennant coming in a close second. Favorite companion? Amy, along with Rory. And I’m pretty fond of River. Favorite episodes? I loved the weeping angels episodes, along with the two library episodes. I’ll be looking forward to the new season this summer! What are your favorites—Doctors, companions and episodes? I’d love to hear! An excerpt from my short story, “Vanities”, available free for a limited time on my Winter Kingdoms page on Facebook. I followed Alard through the winding, cobblestone streets, taking every opportunity to twist my neck to see the buildings around me. I hadn’t existed for enough centuries to become jaded yet, and part of me hoped I never would. Even Alard, as old as he was, still managed to have a spark of curiosity about him. 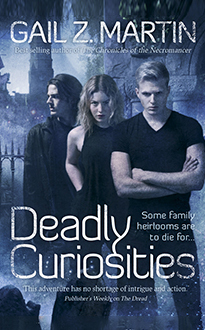 He’d told me once that the vampires who survived the changing times were the ones who never stopped being curious. Then he told me that by that measure, I’d outlive them all. I’m still not sure whether that was meant to be a good thing or not. I took it as a plus. So far, being dead (perhaps ‘undead’ was a better word) had been good to me. Alard stopped in front of a small shop several streets behind the waterfront. A sign said “Vanities,” and, from the window I could see that it was one of the antiques and curio shops that Alard favoured. “In here. Be quick about it.” Alard motioned for me to maneuver our bags through the narrow door. The shop looked closed. I was about to protest that breaking into a shop might attract the attention we were trying to escape, when a lamp flared behind us, its glow shaded to avoid making it too easy for passers-by to see. I put the bags where Alard bid and followed as Alard and our host continued, more than began, a lively conversation. Two things stood out to me: they were obviously old friends, and our host was clearly mortal. “Drink this.” Alard must have known that after the voyage my hunger might endanger our host. I usually had good control, but it wasn’t wise to be in close quarters with such fresh, delicious blood when I hadn’t eaten. He handed me a goblet of blood, goat blood by the smell, and although while not my favourite, I was hungry enough not to quibble. Carel motioned for us both to take a seat. We were in a fairly large sitting room. Everywhere I looked there were manuscripts: old, leather-bound illuminated manuscripts, and such a multitude of trifles and treasures that I hardly knew where to look first. The books alone would have been worth a small fortune. Alard had been expanding my thiefly education to recognize value that the commoner might overlook. “What do you see, Sorren?” Alard downplayed my guesses that he could, as my maker, at least partly read my thoughts. But there were too damn many coincidences for me to doubt. I’d learned to keep my mouth shut when I was mortal. Now, I’d learned to keep unflattering comments in the back of my head, where they hadn’t quite taken form as words. I was grumbling a bit to myself like that now, and if Alard read it, he didn’t respond. Before we could quibble more over wording, the door opened. Alard moved before the handle turned, and I was just a blink behind him. Without a word, we’d both flattened ourselves against the ceiling. Mortals rarely look up when they’re indoors. Welcome to the 2012 Hawthorn Moon Sneak Peek of Ice Forged! 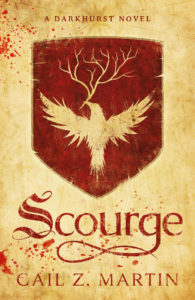 Condemned as a murderer for killing the man who dishonored his sister, Blaine “Mick” McFadden has spent the last six years in Velant, a penal colony in the frigid northern wastelands of Edgeland. 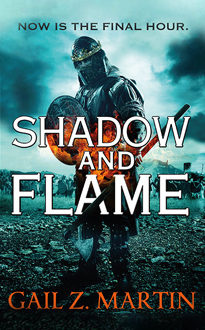 Harsh military discipline and the oppressive magic of the governor’s mages keep a fragile peace as colonists struggle against a hostile environment. But the supply ships from Dondareth have stopped coming, boding ill for the kingdom that banished the colonists. 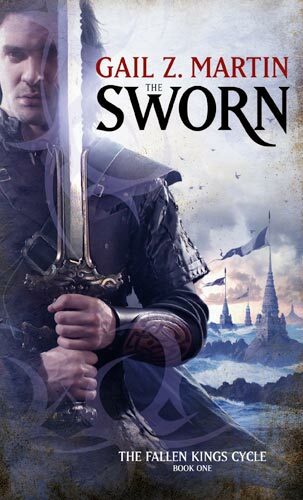 Ice Forged is Book One in my brand new Ascendant Kingdoms Saga. 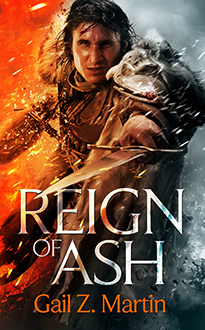 Book Two: Reign of Ashes will come out in 2014. 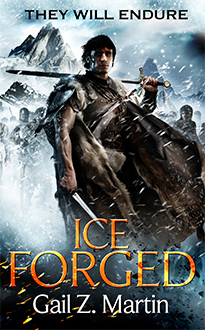 Ice Forged will be available in stores and online world-wide in January 2013. 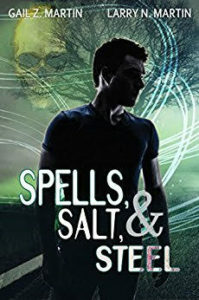 But you can read an excerpt here, plus get exclusive Q&A, interviews and other online goodies by visiting the partner sites, which are listed on my web page. During the Hawthorn Moon event, you can find never-before-released excerpts, interviews, audio, video, and goodies, plus book giveaways on a variety of great fantasy sites that have agreed to be part of this debut party. 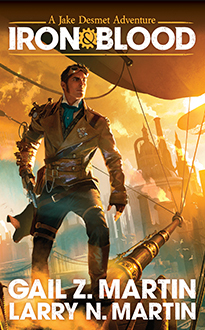 OrbitBooks.net—First look at the cover art for Ice Forged plus a Q&A with main character Blaine McFadden. DisquietingVisions.com—? Uncharted Territory: The excitement and terror of writing a brand new series. Find out what I think in my special blog post! MySpace (GailZMartin) and my ChroniclesOfTheNecromancer newsletter—an interview with courtesan/spy/assassin Kestel Falke. And there’s more! Find out about all the other sites that are hosting exclusive content or giveaways at www.AscendantKingdoms.com! An all-new author video message with hints about what to expect in the Ascendant Kingdoms universe! Thank you for checking out my Hawthorn Moon sneak peek party. Enjoy! They didn’t send someone with us to the barrows. They didn’t have to. We knew what would happen if we didn’t come back with the necklace. The look in my mother’s eyes bound me more to see it through than my word to Jammer. I didn’t doubt Jammer would kill them if we failed or ran off. “We could light a big fire and warn the men.” Coltt had obviously been giving some thought to our options. “One of us could run for the next village,” Nesh offered. I shook my head. “If we light a fire, Jammer will see it. We’d have to get the whole way to the other side of the cliffs to hide it, and if we do that, the men won’t know it’s for them. And it’s a day’s walk to the next village. Jammer said to be back by dawn. Even if one of us got there, he couldn’t get back in time with a mob.” I’d thought of the same things on the hike to the barrows. From the looks on their faces, Coltt and Nesh had reasoned through it, too. We had no choice but to go on. For autumn, it was a hot day. We were all sweating by the time we reached the barrows. I stopped and took a deep breath. The barrows were about a candlemark’s hard hike directly inland from the village. There were three of them, and they might have been mistaken for hills if the rest of the land weren’t so flat. I’d heard about the barrows since I was a kid. The old women warned children that the barrow wights ate children who wandered away from the village. At first, I thought it was just a tale to keep the children from running off. Then I noticed that even the hunters made a wide circle around the barrows. I’d gone out once with my father to look for deer and I’d asked why we couldn’t just climb the “hills” for a better view. He’d gone gray in the face and told me they were an evil place and to stay clear. Now we were going into them. Jammer let us take equipment to unseal the barrows. Coltt and I had picks and Nesh carried two shovels. The pirates seemed pretty confident we couldn’t use them for weapons. Hell, they hadn’t even cared about taking our knives. After all, they had muskets. I had the awful feeling that whatever was in those barrows wouldn’t be scared of either knives or muskets. Nesh also had a bag of reeds and a flint and steel for torches. Jammer had thrown us some dried meat and cheese with a laugh that told me our meals were numbered. “Feel what?” Coltt asked. Then he closed his eyes for a moment, and so did Nesh. I could see the change in their expression. My magic felt jangly, like warning bells in my mind. It was the same feeling I got when there was a bad storm coming at sea, long before we saw the waves. That jangle had saved us many a time out on the ocean, warning us to head home before the squall hit. Only now, we couldn’t head home. We were heading straight into the storm. Then I heard it. It was faint, like a voice calling from a distance. I pictured the necklace Jammer had drawn with a stick in the dirt floor of the lodge, The more clearly I pictured it, the louder the voice called to me, directing me to its barrow. I didn’t like the voice, but I’d heard it before. I’d heard it in my dreams, bad dreams where a voice tried to call me out into the night, or onto the dark water. It was the kind of voice you knew in your bones only wanted you for your meat. Despite our quest, my mood lifted as we left the gray North Atlantic for the warmer waters of the Caribbean. We easily kept the merchant ship in our sights, with a plan to attack that night, before we reached Bermudian waters. Yet even the warmer temperature and bright sunlight couldn’t drive away my sense of misgiving. And the nearer we came to Bermuda, the more my magic tingled in the back of my mind. There was something strange about these waters. Growing up along the coast, I’d heard stories of ships lost to pirates and to the treacherous reefs. There were dozens, maybe hundreds of ships that had gone down over the last few hundred years in the shipping lanes between Bermuda and the mainland. Some blamed it on reefs while others cursed fickle winds and dangerous currents. But as we sailed onward, I recognized another reason these waters had become a graveyard of ships. Magic. I could feel the wild magic on my skin, making the hairs on my arms rise. It waxed and waned like the wind, swirled in eddies no one else could see, and slipped along the surface of the sea in places, racing the current. It was a tinderbox, waiting for a spark. “Do you think he knows we’re here?” Coltt asked. “More to the point—if he did know, would he care?” I wasn’t sure what the limits were for the magic of those confounded boxes, or what type of magic it was. The sooner they were off Lawry’s ship and onto ours, the happier I’d be. While the Vengeance couldn’t outgun a warship, our guns were more than adequate for frightening a merchant ship into submission. Adjusting our sails, we quickly pulled up alongside the Sea Lass, and readied our guns for a shot across their bow. But as my men went to load the cannons, the Sea Lass slowed and came around, and as it did so, wooden panels in the sides opened up, baring the muzzles of twenty cannons. That was five more cannon than the Vengeance carried, which wasn’t good. We looked up to see Lawry smirking at us from the deck, which now brimmed with heavily armed pirates, not the passive merchants we expected. Shots fired, close at hand. I looked up to see that eight of the ten new sailors I had hired in Philadelphia stood armed, their flintlocks pointed at the rest of the crew. Grappling hooks flew through the air, pulling the Vengeance closer to the “merchant” ship as rope ladders were flung over the larger ship’s sides and dozens of invaders scurried down the ropes to land on the Vengeance’s deck. Lawry’s pirates and the turncoat sailors prodded the rest of us to climb the rope ladders that hung from the sides of Lawry’s Sea Lass. We were badly outnumbered and while we would have given them a fight for their money had we the chance to draw our guns, as it was, we were outmatched. Lawry did not answer. He sent the majority of his sailors and the traitors from my crew back to their posts with a jerk of his head. Several armed guards herded most of my loyal crewmembers into the hold, while Lawry and three of his guards motioned for me, Coltt and two of my crew into his cabin. There on the desk in his cabin sat the mirrored cube Coltt had spotted in Lawry’s room back in Charleston. And as Lawry entered the cabin and locked the door behind him, I saw the small cube on its chain around his neck. Lawry wore a triumphant smile, and the armed guards made him bold. I remembered how my own powers had sensed the oddness of the magic in this place, how my nerves jangled and my skin crawled. “Magic?” I said, wondering whether Lawry could sense my power. I clamped down my shielding, just in case. Lawry’s smile broadened. 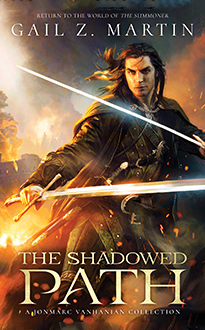 “Let me show you.” He jerked his head, and two of his guards pushed one of my crewmen forward. Lawry removed the cube necklace from around his neck and held it out toward the frightened hostage. The mirrored surface of the cube began to shimmer and glow. It flared, and for an instant, I thought I saw a reflection of the crewman’s terrified face reflected and distorted in its surface before the man fell down dead without a word. Coltt and I surged forward to take Lawry, but the guards held us back. He turned his cube on the second crewman, who met the same fate as the first. This time, I was certain that I saw a reflection of his face on the small cube. Lawry fingered the cube fondly. “A tool. What matters more are the souls in my cache that amplify my magic, giving me the power to bend this region’s wild magic to my will.” He walked over to the large cube and held the small cube out toward it. Both cubes pulsed with a bright glow, and I felt a surge of old, strange magic as a flicker of light moved from the small cube to the large one. Worse than that, in my mind, I heard both of my crewmen scream, and I knew in every fiber of my body that it was their souls held prisoner within that awful cube. Who are your favorite fictional pets? I’m a pet-lover, so I enjoy pets that are written well in fiction. I think for sheer number of fictional pets, the Harry Potter series probably holds a record, with all of Hagrid’s pets (Fang, Fluffy, Aragog, Buckbeak, and others) as well as Scabbers, Crookshanks, and all of the owls. Data the Android had his pet cat on Next Generation, and Captain Kirk had the tribbles. Dr. Who has K-9, and even Harry Dresden has pets. Of course, in mystery series, cats seem to be represented more often than dogs, but sci-fi/fantasy seems to have some of both, with some otherworldly creatures thrown in for good measure. In my own Chronicles of the Necromancer series, Tris Drayke has two wolfhounds and a mastiff, and a perk of being a summoner is that you know when the ghosts of your departed pets are still with you. Who are your favorite Villains? We just finished up a fun session in my Thrifty Author Meetup group about villains. Everyone had fun talking about who their favorites were and why, and then we hashed out how to create good villains in our own writing. I know we mentioned more, so if you were at the meeting and you know which ones I’ve missed, or you just want to nominate some of your own, please add to the list! Once again, Ravencon in Richmond VA was a fantastic event. From the steampunk Darth Vader to the wealth of panels to choose from, to the great dealer room, it’s always a well-run con and a darn fine party. Personal panel schedules were not available when I checked in, so I started the con by showing up at the wrong panel (they let me stay), but I had a blast anyhow. One of my favorite panels was on the “magical middle class”—characters in Harry Potter who weren’t main characters, but who kept the world running. It was the perfect topic for a panel, and we had a full room with people who were not afraid to participate—which is ideal for those of us upon the panel who don’t want to do all the talking. One of the evening highlights was an invitation-only scotch tasting party where I learned a lot about both scotch and Scotland. As usual, the Capclave and Barflies parties were both well attended and great places for free-wheeling discussions. And although I didn’t make it to the Belle Morte concert, I have it on good authority that it was fantastic, as was the masquerade, which I did attend. Next up is Balticon, where I have a short story in the Spells and Swashbucklers anthology that will be having its launch party. I hope to see you there! Think of your book as the ice breaker for an ongoing conversation between the author and the reader. If the book has made an impact on the reader, it’s only natural for him or her to want to continue the conversation, ask follow-up questions, or go deeper. That’s why it’s important for your site to give readers something they won’t find anywhere else—extra value. “Value” can take many different forms. You could have a forum area where readers can post questions and you can respond, or where readers can discuss the book with each other. You could post extra material that didn’t fit in the book, or updated information that became available after the book went to press. You can add your voice and personality through blogging, audio and video so that readers who can’t see you in person at an event still have the feeling that they’ve met you. Most of all, you can extend what it was that they really liked about the book by giving them more of it. For a non-fiction author, this can include posting new tips, links to additional resources, quizzes or research results. For a fiction author, it might mean creating new content not available elsewhere, or posting content first on your own site to reward faithful readers. Authors who have a new book in the works definitely want to let readers, reporters and reviewers know, and readers who enjoyed the first book will find it valuable to know that there’s more good stuff to come. One way to provide this value is through free downloads and an email newsletter. A free download could be a bonus chapter, brand-new article or report, but anything that can be delivered via a web link or email is a possibility, so long as the reader would consider it to be valuable. If you ask visitors who want to receive the free download to enter an email address, you are now building a permission-based mailing list (otherwise known as an opt-in list). It’s important to have permission before sending out group emails (such as announcements or newsletters) because you can get in a lot of trouble if your emails aren’t wanted and get reported as “spam.” The Internet community takes a very dim view of unwanted emails, and if your emails generate too many complaints, you may find your site taken down or your email disabled. When visitors choose to enter their email address in order to get a free downloadable bonus, they are giving you permission to use that email to stay in touch. You are also making an implicit promise not to bombard them with sales pitches and junk. Email announcements and newsletters should give readers the option to unsubscribe easily. Your opt-in list is a valuable tool for staying in touch with readers, and your website helps you to build your list and deliver the downloadable bonus items. Once you have a growing opt-in list, you can use your email newsletter to remind readers of upcoming live and online events, new books, related products, classes and speaking engagements. Treat your opt-in list like a precious treasure and only send information that readers will find valuable. Of course, authors want people to buy and read their books. Authors also want readers and reviewers to say nice things about the book to others, encouraging more sales. Authors would like to be featured in the media as an expert and as the writer of a successful book. Some authors want to use a book to encourage readers to become clients of their business. Many authors see the value in being invited as a speaker to events, conferences and conventions. They want to use the book as a platform; and they also want to use speaking engagements to connect with more readers. For authors who plan to write more than one book, they’ll want to keep readers fired up about how much they liked Book One so that they will run out and buy Book Two. Authors who have written a book about making personal, social or political change may also want to keep readers engaged so that readers will put what they’ve read into action. Most authors want to be seen as experts and as successful and credible professionals. Whether or not your website is successful depends on how well is gives readers what they want and helps you get what you want as the author.